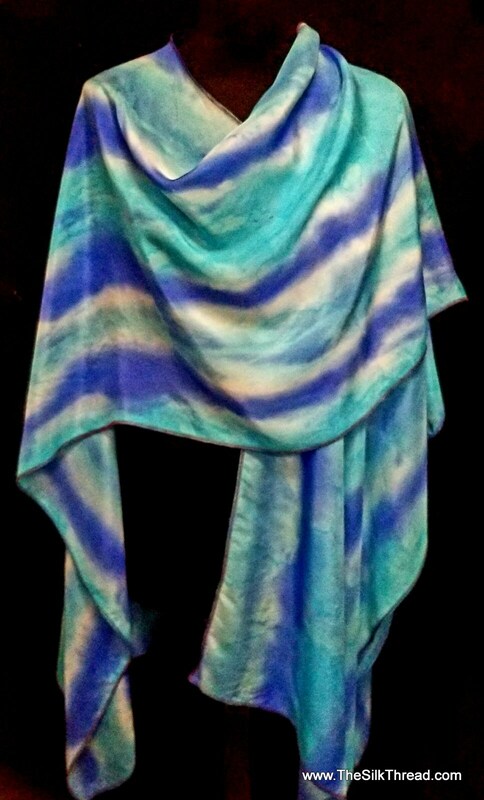 This gorgeous silk Ruana (shawl, wrap or cape) is a lustrous soft silk designed by me in a beautiful combination of shades of blue and turquoise (colors can vary in your monitor) The design runs throughout the piece in a flattering abstract stripe pattern. Handcrafted in my studio from my own design, this ruana simply wraps around the shoulders and can be worn in a variety of flattering ways. (see wine one in photo) It drapes beautifully and can be looped in the front or used with a scarf slide like the one pictured (sold separately). Flip up one side over the shoulder or both. This is a lovely statement piece for all sizes! Pure silk! Hand wash in cold water, lay out to dry or quick tumble dry in moderate heat in dryer. Totally sustainable, renewable and eco-friendly fashion art. Each one is unique and one of a kind.